Also Recommended: Welcome to the NHK! Notes: Originally aired on Fuji TV's noitaminA block. It is the first original series to air on that block. The original character designs are by Chika Umino, creator of Honey and Clover. Akira Takizawa wakes up one day naked outside of the White House. The only things on him are a gun in one hand and a phone charged with a huge amount of money (over 8 billion yen) in the other, with a voice of a woman named Juiz on said phone with only a gun in one hand and a phone in the other. At the same time, Japanese college graduate Saki Morimi is visiting America with her friends when she throws a coin into the White House gates, which gets her in trouble with the police. At the same time she meets Akira and, after a series of misunderstandings/events, the two start to slowly get to know each other more. Akira himself tries to figure out his involvement with the terrorist act of Careless Monday, which involved ten missile strikes on six major Japanese cities. 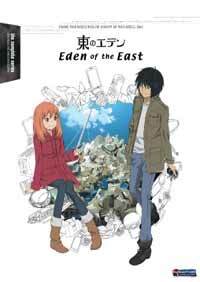 For my 100th review milestone, I chose to review Eden of the East, one of the most beloved anime of 2009. And despite its short length, it tells a very long, intertwining story with a fairly big cast. The two core characters, though, are Akira Takizawa and Saki Morimi. I especially like Akira, who, despite the obstacles he has, manages to keep a warm disposition throughout - even his threats to smack a certain person seem more amusing than threatening. A man with no past, the majority of the events in this events are about him retracing the steps to what happened before his case of amnesia, which isn't fully Divulged until the final episode of the series. Saki, however, is not as deep. In fact, until a good deal into the series, I thought she was dead weight. While not an annoying character, she simply feels out of place in the series' darker, more intense moments until a particular point in the series requires her character to be integrated into the core story once more. The rest of the main side characters are Saki's friends, who run a recycling company turned big business called Eden of the East. The standout of the group is Saki's best friend, the intelligent Micchan (real name Miuru Katsuhara, but never referred to in-show as such), whose cuteness, calm demeanor, and dry humor are more than welcome when the show gets too serious. Other people in Eden include Mikuru's cousin Kazuomi Hirawa, the straight-man of the club who plans to create, in his words, a "NEET paradise"; Sister (she's never given a proper name in the series), the, well, big sister of the group; Haruo Kasuga, the nerdy, angry type; and Satoshi Osugi, a guy with the hots for Saki and the hates for Akira. While the rest of Saki's friends are a decent bunch of characters (as are her older sister and her husband), Osugi will get on your nerves. He only gets more and more obnoxious as the series continues, and after a while you'll just want to throttle him. Anywho, let's mosey on over in this review to the main story. It's complicated to elucidate - the series starts viewers off in the dark, leaving you to construe bits and pieces of Akira's past on your own, with sparse information to lead you on to fulfilling the puzzle involving his past. Along the way Akira will meet other people playing a certain "game" as him - some good, some misunderstood, and some who are evil. Also along the way he shares some tender moments with Saki which are ambrosial, especially early on in the series. Saki, meanwhile, has a story of her own concerning family and employment, which eventually does link together to Akira's story. So kudos to Production I.G for having Saki's screen time not be complete filler, I guess. Actually, except for a few scenes with Saki, Eden of the East spares very little expense in telling its story during its finite run. From episode one until the end of the series I was drawn in to the mysteries of Akira Takizawa's past. I can't remember the last time I actually stopped watching a series temporarily just to hold off from marathoning it all in one go. It was a difficult thing to do, believe me. And while it does have its fair share of eye-rolling moments (particularly a scene with train cargo at the end of episode 10), I genuinely enjoyed the story of Eden of the East from beginning to end. On another happy note, the art and animation are pretty good in Eden of the East. Ugly, unnecessary CG aside, the 2-D backgrounds look gorgeous, and the animation of the characters, when they need to move around, they do so quite well. The actual character designs, however, are a different story. Anyone who's read Honey and Clover, or at least look at pictures of it, will recognize Umino's designs right away. While they kind of work in manga form, they don't so much in animated form. Nearly the entire cast have awkward, slanted eyes, stub noses, and weird, floating mouths. Not to mention a lot of the cast looks like Honey and Clover rejects - Saki seems to be the only stand-out amongst the main cast, mainly due to her distinctive orange hair. That's not to say the characters are ugly - but the super shoujo art style of the characters kind of looks weird compared to the gorgeous scenery around them. I'm a huge shoujo nerd, and the character designs still kind of bothered me. A few minor gripes aside, Eden of the East is a great show. I really wish I could give it five stars, but I can't. The flaws, as minor as they are, add up to subtract an entire star from the series in my book (Osugi, stupid "humorous" bits, awkward character designs). Still, I'd be lying if I didn't say I enjoyed this series immensely. Few anime these days are produced exclusively for television, and it's nice to see original, good material like Eden of the East to help rekindle why I got into watching anime over 10 years ago in the first place. Thanks for the 100th review, Production I.G! And hurry up with those movie releases, FUNimation - I wanna see what happens next! Recommended Audience: Another case of deceptive DVD covers. While the series isn't graphic by any means, there is gun violence, suggestive themes, fan service, and adult situations. There's also a lot of naked guys in the final episode, though their privates are thankfully whited out. Older teenagers and up only.